Still Life is a form of painting which requires a different approach compared to landscapes. I like to strongly create an illusion of realism with the marks of creation (brush strokes) in contradiction to the realism we witness. To see daubs of paint which transform into a solid real world is magical. This requires more colours than I used in the previous paintings. There are no atmospheric effects on the colours so they will be richer with less ‘misty distance’ tints. My basic Burnt Sienna (red), Yellow Ochre (yellow) and Cobalt Blue (blue) does cover the range but each one is helped by stronger colours. Burnt Umber, Alizarin Crimson, Cadmium Yellow and Ultramarine Blue. The basic drawing is simple enough. If you have your subjects positioned and you are using solid objects, as I have, the basic shapes are spheres, cones and cylinders. An interesting grouping or composition of objects is found by moving the objects and observing the scene. I would not spend much time on the initial drawing as it will be covered several times before you are barely started. Because I like to finish a painting in the one sitting this requires a different treatment when painting a still life. Its the most interesting part of this demonstration. Paint has to be placed on top of previous layers without much mixing taking place. The painting of the glasses illustrates this and is probably the most difficult thing to do ‘wet on wet’. You have one shot to get it right. If I waited a few weeks for the under layers to dry I would have the opportunity to paint the glass and wipe off and try again if I was not happy with the previous attempt. These results, I think, are rigid and hard and not as interesting as the ‘wet on wet’. But if this is what you have to do, so be it. As you can see from the demo there is an uneven reflective gloss from the surface regardless of the angle of view. This is because there is very little medium in the paint. The colours are ‘dry’ and the brush bristles leave ridges which catch the light. I have to work this way or subsequent paint layers will lift the under layers rather than sit on top. An essential component of this method is ‘Liquin’. I mix it 50/50 with Linseed Oil and use a lot of White Spirits. You will notice I do a lot of vigorous brushing which thickens and makes the Liquin ‘tacky’. I would take a few days for this to happen if I used Oil on its own without the Liquin. When the delicate parts (as in this case the glasses) are in place I then try and reintroduce the brush strokes which are an attractive feature in this painting. I think the time lapse video is better than the real time, which would require several videos as in the Impressionist Style Painting. This painting took 2 hours to complete. P.S. I used the handle of a brush to ‘scratch’ an image of the glasses into the underlying wet paint. The brush which had the background colour is then used to remove any scratch marks not required. 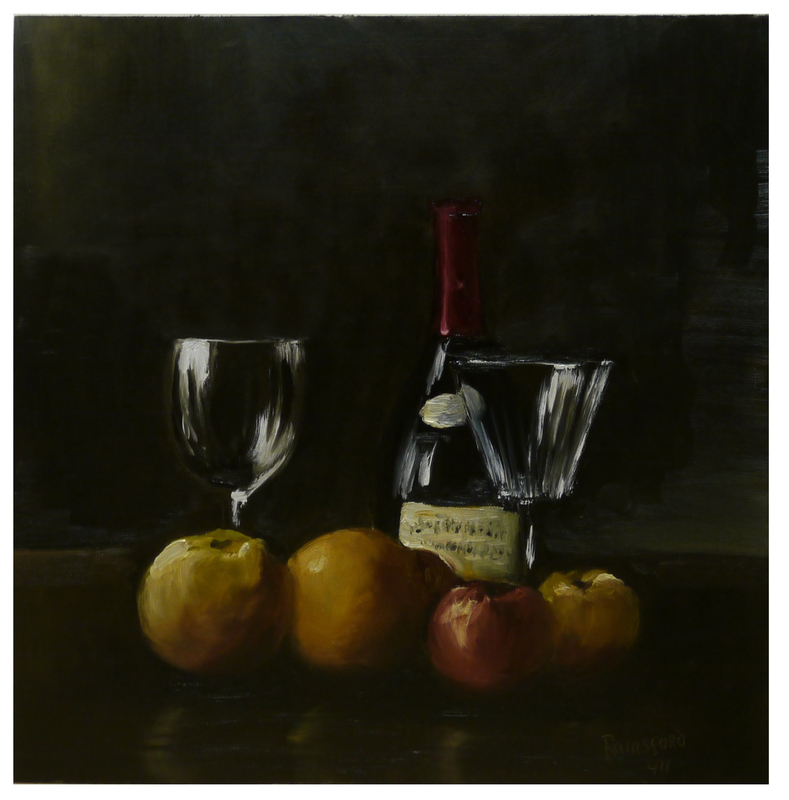 This entry was posted in Oil Painting and tagged Art, Oil Painting Class, Oil Painting Demonstration, Painting Instruction, Painting of Glass, Painting Tutorial, Still LIfe Painting. Bookmark the permalink.